iPad started the era of tablet computers using the same operating system as mobile phones with the features of a computer. The concept of tablet computers came into existence a long time ago but its commercial life was given by Apple in 2010 and it spreads like fire in the public since then. Tablet computers are the ultimate in electronic simplicity with high portability, with few built-in controls except for a flat touch-screen interface; tablet computers are attractive, easy so are becoming one of the personal assets like cars or flats. Android tablets are the major competitors for iPad. Android is a Linux-based operating system designed primarily for touch screen mobile devices such as smart phones and tablet computers by Google to advance open standards for mobile devices. The first product of Android was a mobile device platform built on the Linux kernel version 2.6 and the first available phone to run Android was the HTC Dream, released in 2008. In 2010, Google launched its Nexus series of devices, smart phones and tablets running the Android operating system, which are upgraded and updated with time. Both iPad and Android tablets has change the way that people gather and organize information and becoming a part of our society. Both the iPad and Android tablets have a touch-screen interface and online offers to direct purchase and download applications to the systems. The home screen of the most tablet devices is made up of App icons and widgets; App icons launch the associated Apps, whereas widgets display live, auto-updating content such as the weather forecast, your email inbox, or a news ticker directly. The Apple ecosystem including App Store, which has over 800,000 apps, with 300,000 are designed specifically for the iPad and the rest capable of running in compatibility modes. The iPad also tends to be more stable and easier to use than Android tablets. Apple approves each App individually, ensuring elimination of the bugs making it safe to use while Android has made great steps to make them simple to use and is easy to scale it up. Contrary to iPad limited versions, Android tablets are being monitored and developed by various big and small companies so their operating systems are supported by large number of hardware manufacturers. Android Apps can be acquired either through an app store such as Google Play or the Amazon Appstore, or by downloading and installing the application’s APK file from a third-party site is only possible with the Android systems (although you should definitely consider hidden safety issues). The iPad vs. Android is a difficult question but the answer is you. Yes that’s true according to your needs you can decide which one you should go for. Since a tablet is not mean to replace your laptop or PC, you should consider how you could seamlessly intergrade your new fancy gadget with your existing digital devices. If you are a Mac user, an iPad is a pretty good choice, since it will be compatible with your current workflow. It can be more difficult when you are bound to build a new ecosystem – either for yourself or your organisation (such as schools). Small differences in price and specs shouldn’t weigh too much for your final decision; the better ecosystem with more high quality tablet Apps (now and in future) will assist you in working, teaching, learning and sharing and save you more in the long-term. By now, many developers still focus their resources on Apple’s ecosystem to obtain better monetary returns for their investment. Many high quality tablet Apps arrive first (and often exclusively) on the iPad. 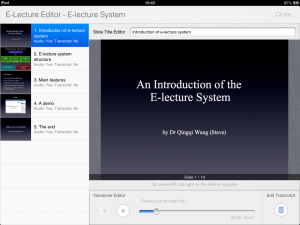 For example, many of our (TouchApp) high quality educational tablet apps such as Focus on Plant, E-Lecture Producer etc. are only available in iPad format as the moment. These developers help Apple to defend its first-mover advantage against Android. However, with the support and involvement of big Tech players (Google, Samsung etc. ), Android is rapidly catching up and attracts more talent developers. Although its difficult to say which will win in a long run or can cope up with the newest technology as opinions vary person to person. As said by Andrew Carnegie while the law of competition maybe sometimes hard for the individual, it is best for the race, because it ensures the survival of the fittest in every department.